Concrete structures have been built for more than 100 years. At first, reinforced concrete was used for buildings and bridges, even for those with large spans. Lack of methods for structural analysis led to conservative and reliable design. Application of prestressed concrete started in the 40s and strongly developed in the 60s. The spans of bridges and other structures like halls, industrial structures, stands, etc. grew significantly larger. At that time, the knowledge of material behaviour, durability and overall structural performance was substantially less developed than it is today. In many countries statically determined systems with a fragile behavior were designed for cast in situ as well as precast structures. Lack of redundancy resulted in a low level of robustness in structural systems. In addition, the technical level of individual technologies (e.g. grouting of prestressed cables) was lower than it is today. The number of concrete structures, including prestressed ones, is extremely high. Over time and with increased loading, the necessity of maintaining safety and performance parameters is impossible without careful maintenance, smaller interventions, strengthening and even larger reconstructions. Although some claim that unsatisfactory structures should be replaced by new ones, it is often impossible, as authorities, in general, have only limited resources. Most structures have to remain in service, probably even longer than initially expected. In order to keep the existing concrete structures in an acceptable condition, the development of methods for monitoring, inspection and assessment, structural identification, nonlinear analysis, life cycle evaluation and safety and prediction of the future behaviour, etc. is necessary. The scatter of individual input parameters must be considered as a whole. This requires probabilistic approaches to individual partial problems and to the overall analysis. 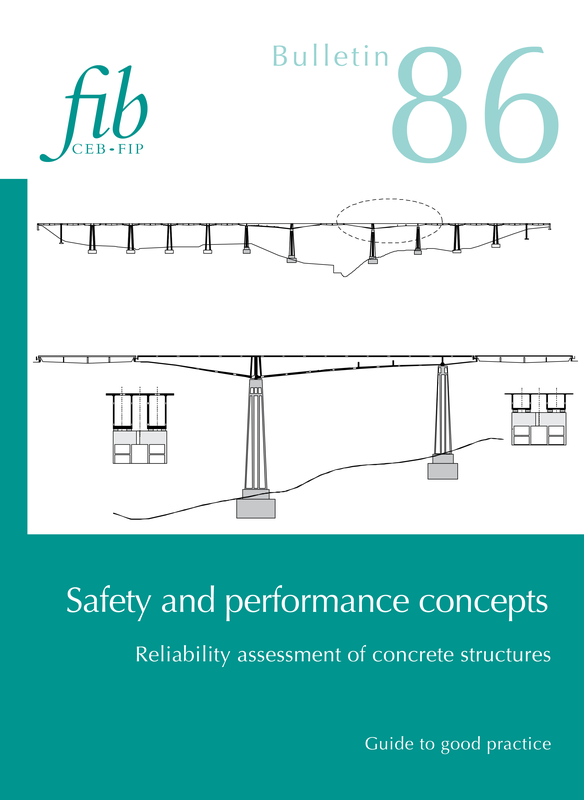 The members of the fib Task Group 2.8 “Safety and performance concepts” wrote, on the basis of the actual knowledge and experience, a comprehensive document that provides crucial knowledge for existing structures, which is also applicable to new structures. This guide to good practice is divided into 10 basic chapters dealing with individual issues that are critical for activities associated with preferably existing concrete structures. Bulletin 86 starts with the specification of the performance-based requirements during the entire lifecycle. The risk issues are described in chapter two. An extensive part is devoted to structural reliability, including practical engineering approaches and reliability assessment of existing structures. Safety concepts for design consider the lifetime of structures and summarise safety formats from simple partial safety factors to develop approaches suitable for application in sophisticated, probabilistic, non-linear analyses. Testing for design and the determination of design values from the tests is an extremely important issue. This is especially true for the evaluation of existing structures. Inspection and monitoring of existing structures are essential for maintenance, for the prediction of remaining service life and for the planning of interventions. Chapter nine presents probabilistically-based models for material degradation processes. Finally, case studies are presented in chapter ten. The results of the concrete structures monitoring as well as their application for assessment and prediction of their future behaviour are shown. The risk analysis of highway bridges was based on extensive monitoring and numerical evaluation programs. Case studies perfectly illustrate the application of the methods presented in the Bulletin. The information provided in this guide is very useful for practitioners and scientists. It provides the reader with general procedures, from the specification of requirements, monitoring, assessment to the prediction of the structures’ lifecycles. However, one must have a sufficiently large amount of experimental and other data (e.g. construction experience) in order to use these methods correctly. This data finally allows for a statistical evaluation. As it is shown in case studies, extensive monitoring programs are necessary. The publication of this guide and other documents developed within the fib will hopefully help convince the authorities responsible for safe and fluent traffic on bridges and other structures that the costs spent in monitoring are first rather small, and second, they will repay in the form of a serious assessment providing necessary information for decision about maintenance and future of important structures.